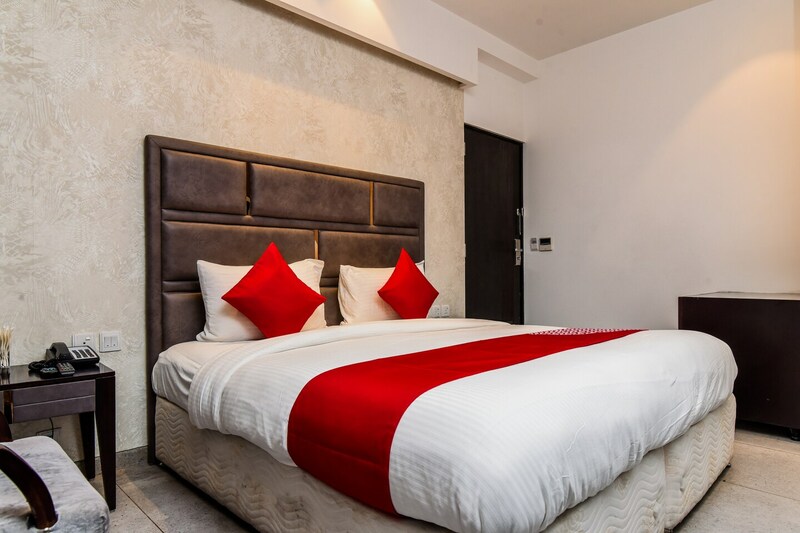 Edition O 30008 Pitampura is a modern property with sleek grey exterior and lavish interiors, located near Vardhaman Market in Co operative Group Housing Societies Pitampura, in Delhi. The property comes with in-house kitchen and a stylish lobby lounge. The rooms are done up in classy shades of white and grey, and feature beautiful furniture and large windows. Quirky wall arts add to the attraction. The bathrooms are large, lined with beautiful black tiles and have trendy white sanitary wares. In each room, you will find free Wi-Fi, king sized premium bedding, sofa, wardrobe, AC, and TV. In addition to this, power backup and CCTV security surveillance are also available here. You can savour delicious dishes at the nearby restaurants like Pappu Di Hatti, Crazy Chef, and Khalsa Dhaba. Major attractions like Red Fort, Rj Ght, and Jantar Mantar are not too far from here.